A couple of months ago, Dark Angels offered the younger contingent of 26 the chance to win a scholarship place on the celebrated creative writing in business course. 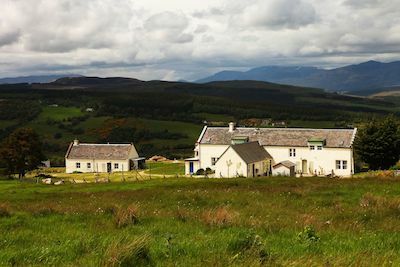 Jamie Delves was the 26er under 30-years-old, not long out of university, who went to the magical Moniack Mhor to spread his writing wings. “Straight Outta Uni” is a funny time. The first question that occurred to me was whether I would have to reference anymore. I did a few jobs for my dad, a copywriter in Edinburgh, and found myself looking to confirm this uncertainty. I told him that some of these strange things in my head just lived in the public lexicon and I would struggle to tag them to original sources or places. They had no intellectual homes. They belonged to everyone. To my deep relief, he told me that I could discard the syntactical practice of referencing and trust the intelligence of my audience. But this question evolved in the company of others. Not just how I referenced material work, but how I referenced myself: who I am, where I want to go, where I’ve been, and why I’ve been there. Right now, every conversation is an interview, and everything waits to be revealed. Unless you lift the curtain. The first big curtain I discovered myself lifting was a Dark Angels foundation course in a removed valley just above Loch Ness at October’s tail. We sat in the belly of a converted cowshed, two unshifting stone walls facing each other, with a fire under our arm in the hearth, the hobbit house down the hill behind us in the darkness, and the unending lines of primeval trees crawling up the mountain on the other side, whispering to each other. But still, we were in an anxious horseshoe, flexing over the most succinct ways to communicate ourselves to each other and asking all those questions again. Why were we here? Not simply existentially, but very practically, what had brought us between these two stone walls in the Highlands to learn about creativity in business writing? I knew exactly why I was there, but because of its barbarous simplicity it was difficult to articulate. There would be no other opportunity for me like this, to spend a week among intelligent people who are a mile or so further down the track than me, who I could enjoy meeting and learning from in a comfortable, residential environment. We drank wine and whisky and beer and water together, two people would cook each evening, and every day we’d sit in the hobbit house with its grass roof and two log burners side-by-side, playing fun literary and writing games, one including a knife and a dictionary, and by the evening, all unfurled and meditative, our notebooks at rest, too, we’d stretch out listening to Jamie (OJ – I’m YJ) playing songs on his guitar that he’d written when he was 22 in Peru, remembered word perfectly. Every day would start with music, too. Music made by us, all together, in chanting an early Christian incantation in either Latin or Gaelic. We would stand in the middle of the hobbit house in a tight circle, following choirmaster Jamie, and we’d stop when he stopped – the length of time we chanted was decided in the moment. Take time.